The Kit Kat Chocoladilla features melted chocolate and Kit Kat pieces folded and grilled in a flour tortilla. If it sounds familiar, the chain offers a chocolate quesadilla called the "Chocodilla" in several countries abroad (they might be going with a different name here in the US due to the similarity of "Chocodilla" to "Chocodile," the name of a Hostess snack cake). In fact, they were selling a Kit Kat Chocodilla in the UK around this time last year. 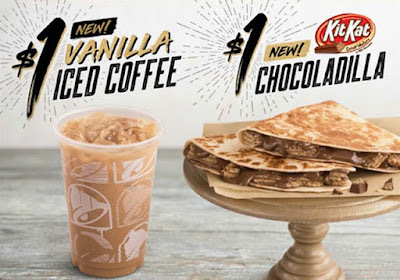 Both the Kit Kat Chocoladilla and Vanilla Iced Coffee are selling for $1 a piece. A Twix version of the Chocoladilla is being offered at some locations instead of the Kit Kat version.